IGADI™ Ye-Oliva in pouch, 1 liter (medium fruity) comes from the lower parts of the olive groves, giving it an exquisite gourmet oil, with a high content of polyphenols and a lot of anti-oxidants. IGADI™ Ye-Oliva infused oils: Fresh basil, has a beautiful character and fresh herbs from the garden, you will taste the fresh basil immediately. Sundried chillies and sundried garlic. It will give your food that little extra needed to top-up your dish. 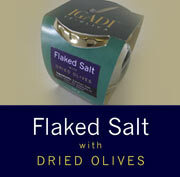 IGADI™ Salt, a pure, natural crystal white salt, sourced from naturally occurring saltpans in Africa’s Kalahari Desert. 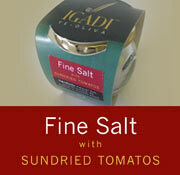 IGADI™ desert SALT has a unique and exceptional pleasant, smooth and gentle salt taste. It enhances and enriches all food flavorings. 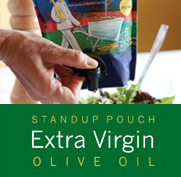 Research has shown that the stand-up pouch is the ultimate package to prevent oxidation of the oil. A pure, natural crystal white salt, sourced from naturally occurring saltpans in Africa’s Kalahari Desert. No added iodine, anti-clumping agents or preservatives, it is neither processed, washed nor refined. Sun dried and directly from the earth. From its rich underground source IGADI™ desert SALT has a high mineral and trace elements content. Correctly balanced for your body to utilize and absorb for optimal functioning, vitality and health of the body. Three underground streams converge in an ancient underground lake, from which the brine is pumped up, laid on the pan in the hot African sun, till sun-dried. The salt is then harvested and packed. There is no depleting of a natural resource and is continually renewable and sustainable. Geo-scientifically tested to be between 250-300 million years old, the underground streams flow over Dwyka rock formations, collecting Sodium Chloride (NaCl) and leaching the minerals/trace elements. The saltpan is situated in the Kalahari desert basin, reaching over of 2.5 million km2. Situated in a region that has never been inhabited nor used for industry, it is almost a totally pollution free area. 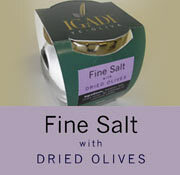 IGADI™ desert SALT has a unique and exceptional pleasant, smooth and gentle salt taste. It enhances and enriches all food flavorings. 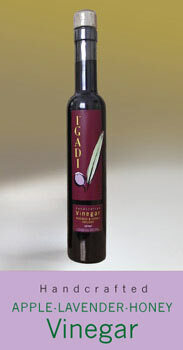 Our exquisite IGADI Extra Virgin Olive Oil infused with fresh dried Chilli. Cooking: use this to add to sauces, marinating fish-meat-vegetables, as dipping, in pesto. 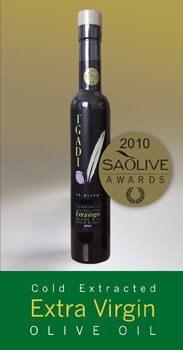 Our exquisite IGADI Extra Virgin Olive Oil infused with fresh dried Garlic. Using: marinating meat, stir-fry, pasta, bread, pizza, dipping. 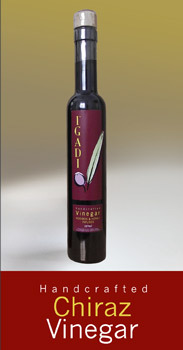 Our exquisite IGADI Extra Virgin Olive Oil infused with fresh dried Basil leaves. Cooking: all season dishes, top-up foccacio, top-up your Mediterranean dishes, soups, tomatoes, pestos, dipping. Dark glass bottle to protect the oil from light. Corked like wine with natural wood. Chiraz/Rooibos and honey infused handcrafted Vinegar. The vinegar is diluted lower than 6% acidity. Organic rooibos and Klaasvoogd honey is used - well balanced vinegar with exceptional flavours. Choice of flint or dark bottle. Corked like wine with natural wood. Apple, lavender and honey infused handcrafted Vinegar. It is a fresh summer vinegar with all the flavors of nature. it to make special sauces, potatoes, tomatoes. Environment friendly & oxidation free packaging. Fine Kalahari Salt, dried olives. No additives or colorants added. Fine Kalahari Salt, sundried tomatos. No additives or colorants added. Flaked Kalahari Salt, dried olives. No additives or colorants added. 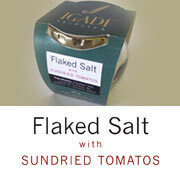 Flaked Kalahari Salt, sundried tomatos. No additives or colorants added.